The individual is on the agenda in Movement. A Manifesto, this year’s Tempo Festival offering from the New Zealand School of Dance (NZSD). This work, by James O’Hara and Balázs Busa, performed by the NZSD third-year contemporary students, is thrilling. It is extremely rare, even in my scant experience, for a work to so thoroughly engross the audience; to calm, challenge, and excite. Movement begins with eleven dancers girding the stage. A white sheet is stretched across the back wall, casting the dancers’ satin-clad legs and Hawaiian shirts in unusual relief. The atmosphere is informal. Sitar-like music plays, and the dancers gather in a soft group. Even in the opening stillness of the work, subtle vibrations granted by blood pressure cause hands to tremble before larger movements take over. Iconography is then explored with reference to the Virgin Mary, baroque intimacy, and Nijinska’s Les noces. O’Hara and Busa seem to foreground their manifesto with historical contrast; a point of departure that teases the audience with glib, perhaps purposefully misdirecting references. As the work progresses, mercurial tableau is abandoned in favour of sustained ‘unison’ that quickly (d)evolves into subtle variation. The movement is minimal, with Graham swing motifs and large, circular arm pathways. The dancers carve the space and wind their spines around malleable axes in drone-like repetition. Later, alongside a change in tone and pace, the dancers explore intricate and rapid thrashing to the excellent mixing of a live sound artist. Prepare to have your heart rate slow to a slumber then accelerate to light-speed. Throughout, the dancers offer brief but powerful glances into the audience before returning to the folding fold. Eyes close and open according to an unseen rhythm. In tandem, the dancers negotiate an increasingly demanding vocabulary with each step bringing them closer to exhaustion—one that is made fully available to an entranced audience. These are not cookie-cutter movers speaking to the ‘effortlessness’ of a Gaynor Miden advertisement. Instead, these dancers give themselves permission to tire and in doing so express personal aesthetics. O’Hara and Busas’ manifesto, therefore, is less concerned with polemic as it is with granting these dancers the opportunity to be themselves. It is coincidence, a happenstance, that these bodies should share this space. Like pages gently torn from myriad books, these dancers assemble in a manifesto-bricolage that does the least of any recent NZSD showings yet simultaneously says the most. 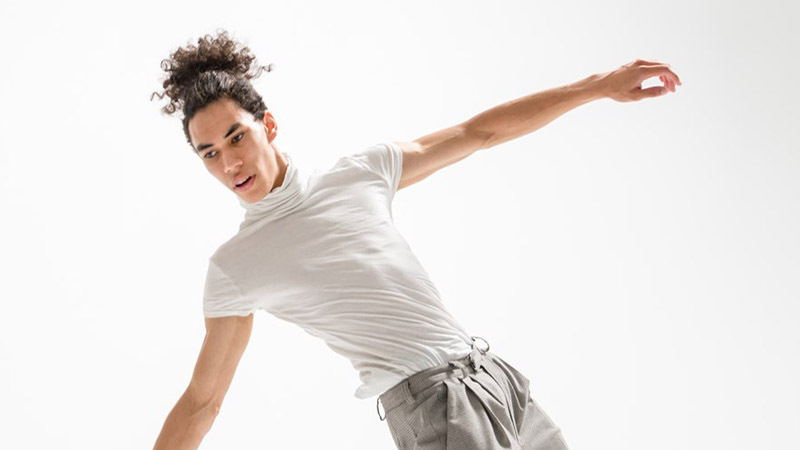 Like a questionnaire, it provides an examination of our expectations of these young dancers and our dance tastes in general: How patient might we be? What role does boredom play in watching dance? In what ways might we, as an audience, access our own bodies through watching dance? Furthermore, what becomes of the individual within the Institution? This work, like several New Zealand contemporary dance entries of late, belongs to the Stevie Nicks milieu—ephemeral, feminine, inquisitive, individualistic: Gold Dust Woman by way of lung cells by way of Freire. Movement. A Manifesto lulls and astounds like a benign dream; a trance that deals in art nouveau sensibilities, techno raving, and the uniqueness of the individual. This is an annihilative piece for dancer and audience alike from O’Hara and Busa, moving and stirring in one. Original generation time 1.5523 seconds.